PHOTOS: Parade of winter storms begin to wallop B.C. Tuesday, February 12, 2019, 12:11 PM -	With snowflakes flying across Canada from the British Columbia coast to the Maritimes, the thought of escaping to more tropical climes may be appealing. But this year, it seems like winter may be one step ahead of us. An unusually strong low pressure centre passing over Hawaii last weekend accomplished a rare feat -- so rare, in fact, officials are calling it "uncharted territory." Snow fell on the Hawaiian island of Maui on Saturday and Sunday, marking what may be the lowest-ever recorded snowfall in the state, according to the Department of Land and Natural Resources (DLNR). "The DLNR Division of State Parks reports that for perhaps the first time ever, snow has fallen in a Hawai‘i State Park," the agency posted on Facebook on Sunday. "Polipoli State Park on Maui is blanketed with snow. It could also be the lowest elevation snow ever recorded in the state. Polipoli is at 6200 feet elevation." Additional snowfall was expected for the park on Monday, as the low pressure centre chugged by overhead. Thanks to the prevailing winds over the mid-Atlantic, most of Hawaii's storms come via low pressure systems sweeping in from the southwest, or as hurricanes from the southeast. This low took a much different path, dipping down from the north and bringing some unprecedented cold air along for the ride. While snow is a relatively common event for the volcanic peaks on the Big Island of Hawaii -- Mauna Loa and Mauna Kea -- it's essentially unheard of on Maui. There is at least one previous record showing lower elevation snow for the island chain; a storm in 1952 reportedly brought snow to Haleakala, the volcanic peak that forms more than 75 per cent of the island of Maui, down as far as 7,500 feet. 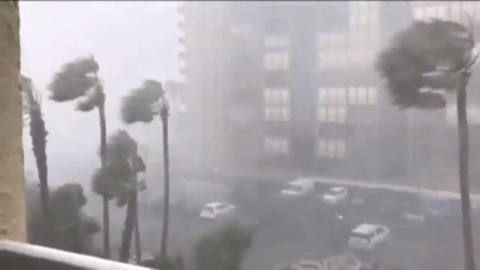 "This storm was uncharted territory for us," Melissa Dye, a meteorologist with the National Weather Service office in Honolulu, told SFGate. "I spoke to a ranger at Haleakala and he couldn't confirm how much snow had fallen because it was blowing around so much." The source of the blowing snow? Vicious winds accompanying the system; the highest gust reported topped 300 km/h atop Mauna Kea, according to Dye. Hawaii wasn't the only getaway destination seeing snow this week. Las Vegas also reported a trace of snow on Sunday; the first accumulating snowfall in the city since December 2015.